Quilt Design | Quirks Ltd.
and how I laid them out for my initial cuts. After I got started, I really didn’t stop for any pictures. This next pic is how I eventually put together the pieces I selected. I did not want this to be stiff with fusible, but I did not want to seam it all together. 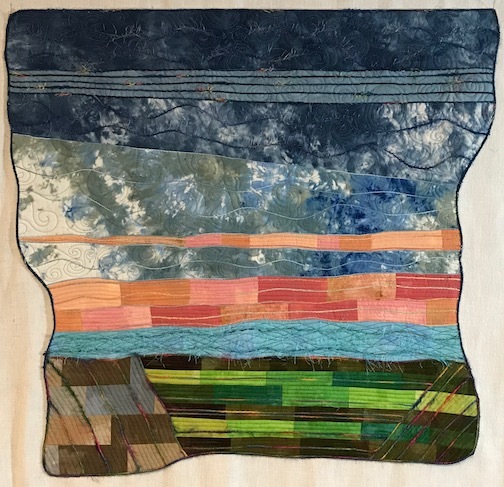 I wanted it to be assembled collage fashion, so I connected the pieces with very narrow strips of fusible and then top stitched. Simple, simple quilting and none of the embellishments that I originally planned on adding. And now that’s it’s all quilted, I’m not sure I’m happy with it. I truly hate the idea of ripping out that center panel of quilting, but I think a simple ‘bridge’ line with a tree sketch might look better. I have to think about it before I commit to such a radical ripping session! However, I have used the fabrics that I loved the best from my leftovers and the rest are retired back to the stash. Looking forward to what will distract me into my next project now! Well, I tackled that midnight idea and wrestled it to the ground. I tucked and trimmed and measured and squared up and got a quilt top. And I really, really don’t like it! Perhaps some embellished quilting could make me love it again, but I’m not feeling it right now! There are some lovely fabrics here, but they are not doing the job I had hoped they would. Now I think the sashing would have been a better solution………and hindsight is always 20/20. It can sit on the shelf for a while, with the other Use Up The Stash projects. What did I learn? Random does not always produce effective design. Improv quite often needs the discipline of tradition to be effective. Now—let’s see what else the studio can surprise me with! When I’m falling asleep at night, I almost always try to have my last thoughts be of studio projects or problems. When I go to sleep with those in my brain, sometimes I come up with a solution…and sometimes I even remember it the next morning! I got lucky this morning and recalled what my subconscious wanted me to do with my hand dyed blocks. My inspiration quilt used hand dyes and wide sashing and I truly thought that’s what I would do. Never really liked any of the fabric I tried for sashing and finally figured out that I didn’t want to put sashing in! So I sewed them all together and worked from this as a busy background! The plan was to insert curves across the face and I selected a bright, obnoxious green or white grunge for auditions! I’d already rejected so many other color combos for sashing…………….. Went with the white and quickly got into cutting the curves. There are no mysteries here so I’ll show you each step. Laid out a chunk of the white across the quilt, picked up the rotary cutter and cut a curve. Sewed those pieces together and went for the easy curve on the second cut–laid the quilt on top of the white and followed that original cut edge. I did that for three curved sections and I have to admit that I have never been good at keeping angles balanced so I will have nice straight edges! Not that improv curves are ever going to come out straight and even, but the left side of this is pretty far off. I don’t want to cut off a lot of the edge to even things up. Couple of possible solutions. I could add a wide, curvy border on each edge and make it all nice and square. Or, my choice, make an adjustment in one of the curved sections. I’ll pinch it up, iron it flat and either topstitch it down if it lays flat enough or re-sew along that pressed fold line. That’s tomorrow’s project, though. Angles can often defeat me, sometimes their challenges exhaust me and today I feel pretty triumphant. I will be able to finish this without sacrificing a huge chunk of the quilt! HA! This was supposed to be a week of plenty of time in the studio, getting lots of things done. And I did get some things done…no, actually, I got ONE thing done! My retreat project is finished, and that includes sleeve and label! Wow! This WAS blocked straight and square and flat, but I sure didn’t smooth it out correctly for this photo! I’m very pleased with how it turned out and I am firm in my resolve that there will not be a series repeating this design…well, unless I vary my technique and capture the essence of the design rather than the exact drafted picture. I have been known to do that. I had to shop for border fabric for the crosscut piece. Mission accomplished on that and the quilting is started. It’s a ‘Dirty Dozen’ challenge to honor 12 years of our Creative Seasons art group. Probably my favorite combination of colors. Have not made any progress in a decision on what to do with the blocks of hand dyes I made at retreat, but perhaps that will be next week’s project. However, since I love these challenge items so much, I think this will have the top spot on the priority list. Also found out that there is not enough interest in improv right now to run a second series of classes at Textiles Fabrics in Milan. I’m not surprised, since this is a low-percentage specific interest. And the bonus is that it frees me up for one of AJ’s spring hockey games…always a silver lining! It’s really hard, sometimes, to get out of the ‘production’ mode of living. There is not one single reason for me to produce anything, except for my own pleasure. There are really no deadlines or demands that are not self-imposed and if I want to be lazy, I can. I’m glad, though, that I have an inner drive to ‘make’. It gives me great happiness in every moment in which my heart and mind and hands are engaged in the process of creating. That makes life so much sweeter than indulging in terminal laziness!!! Retreat weekends are so much fun! It’s a shame that we can’t do them more often, but then it wouldn’t be so special, would it? As I mentioned in my last post, I really had no projects-in-waiting to take along with me. I pulled a bunch of fabrics with a few vague ideas and went off for a weekend of relaxation. I did not care if I accomplished exactly nothing at all! I actually did want to try and make a piece from the design I created in a class with Heather Jones. I’m quite pleased with it and so glad that I am a quilter. Stitching adds another layer of texture and design and there is always the possibility of additional embellishment for even more layers of yummy! I had first thought that I would create multiples in a four seasons format, but it was more difficult to put together than I thought! This is the only season of this design that we are gonna see! And I’ve had a picture in my head of rectangles of hand dyed fabric set in a complementary grid. I added a curve to the rectangles for a bit more pizazz and I’m pretty sure I made enough for at least a full sized quilt. Didn’t have enough of anything I thought might work for a background, but I laid out a few blocks on white and on black to see in which direction I might want to go. I’m not thrilled with either one, so I’ll search from the full stash as I get back to the studio. Maybe charcoal or dark blue. I had been watching the project going up on the design wall across the room from me, and it was really cool. In talking to Sonja, I found out that it was a technique in which you make a quilt top with criss-cross blocks and then cut it up into smaller blocks and re-sew it. I looked at some internet examples and I was on board all the way! I didn’t think I had the right fabrics with me to make an effective design, but I love the technique so much, I absolutely could not wait to try it!!! I pulled what I thought would work and went at it. I finished step one and got the quilt top part finished. I really, really wanted to start cutting into it for the next step, but I truly did not have the proper equipment with me to ensure success. It shall be the first project I work on when I am back in my studio and I am so excited to see how it works out! This landscape seemed to be doomed a few days ago. I started it and did not like it at all. It was too abstract and too cliche at the same time. I set it aside and worked on the seascape that I loved! I picked it up today and decided that it was useable and even figured out how I want to finish it. And changed my mind a bit. I quilted it as a first layer, and plan on adding embellishments. Of course, I’m not sure exactly what embellishments will be added………..that’s the fun of what I do! Adventure is the word that resonated with me today. Every single time that I enter my studio, I feel as though I am embarking on a new adventure. Whenever I say ‘what if…’ and sparks of ideas fly into my imagination, the next escapade begins. And there is always a piece of fabric, or a color, or a bead that inspires action. I cannot imagine that I will ever run out of inspiration, though I am old enough that I CAN envision running out of time or physical ability! This experiment is wrapping up. All the concepts are roughed in and it is at the point of filling in the blanks with the technical, mechanical details. Always fun, as well as being important to strive for excellence, but the mind is free to start exploring territory for the next undertaking. Quite a few more sun ray lines to do, with some metallic thread added for a bit of sparkle! And more quilting to do with the leaves and grasses, but essentially done. My mind has wandered on…and that’s a fitting phrase for what it wandered onto. Alzheimer’s is an affliction that is near to my heart, since my father had it. Every now and then I try to express my feelings about this utterly devasting disease with a piece of art. Not the cheeriest of subjects, of course, but art is emotional–ALL the emotions. This is started and my mind now gets to ask ‘what if…’ for the next steps. I believe it is headed for the foggier brain side of the disease rather than the loss of function of the physical side. The daily adventure that is now my life continues!